Have you had enough of being mediocre? Are you tired of asking your tech gurus a question? Ready to try your hand at being the best? 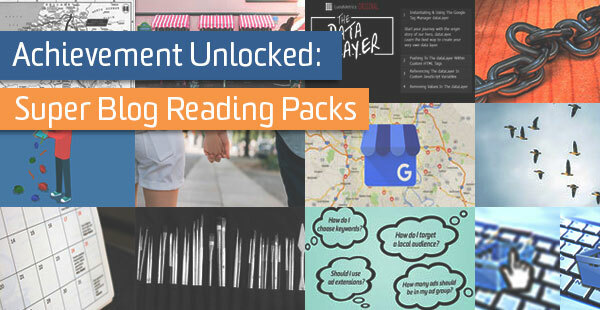 If so, check out these blog packs, ready for your digital consumption. After reading these, you’ll be ready to do life… in BEAST mode. Achievement unlocked! So you want to start a new site? Start with your plan! The more strategy you put in before launching will help you immensely in the long run. Read these blog posts and be enlightened. Launching a website can be a harrowing process. Let Sean McQuaide make it a little less harrowing by following this insightful migration checklist. Having this plan in place and following these steps will definitely make the (re)launch smoother. Defining a goal for your website is important. Knowing how to track that goal is of equal importance. Read this guide and let it help you define your website goals, how to measure them and how they reinforce your overall business objectives. Michael Bartholow covers in great detail the changing landscape of all things that now encompass the Search Experience (SX). Read this article to learn the importance of applying an over-arching SX strategy to your content and technical efforts. Nick Eppinger‘s informative blog post takes you on a journey to discover the right overall strategy strategy for your business and your objectives. Move beyond boilerplate solutions and craft a finely tuned plan that exclusively meets your needs. So you want to start an eCommerce website? Don’t pets.com your way into notoriety. Take advantage of our insight into the world of eCommerce. Why not start your journey here? Samantha Barnes discusses the basics of tracking your small business website. Strategy, common definitions and other reporting tips are all covered. Have questions about enhanced eCommerce tracking? Once again, Samantha Barnes has an amazing write-up tackling the questions you want answered most. She discusses how Enhanced eCommerce tracking can… err… enhance your analytics and your insight into your transactions. Kristen Perko discusses the capabilities of tracking those old-fashioned Brick-and-Mortar store transactions within Google Analytics using App Scripts and the measurement protocol. While more technical in nature, the steps are clearly explained and will surely pay dividends! You’ve built it, but why won’t they come? Perhaps you need to tweak your eCommerce strategy. Stephen Kapusta knocks it out of the park. He discusses not just the “how’s” of Google Shopping campaigns, but he walks you through the “why’s” as well. Get the (Ad)Word Out About Your Website! Anyone these days can have a website. Why not unlock beast mode here, too and make it stand out! Take advantage of LunaMetrics’ vast knowledge of SEO and SEM best practices to grow your following and expand your customer base. Our blogs cut through the clutter and give true insight. Google’s AdWords platform affords you so much power and customization, it would be easy to get lost in the setup. Thankfully, Megan Pritts does a great job breaking down the fundamentals. Read this blog post and be amazed at your new-found SEM Superpowers. Managing and curating how your business appears within Google search is vitally important. One of those ways is to use Google My Business to its fullest. Let this article walk you through the specifics – from account management practices to keeping tabs on any location updates. A must read for any Brick-and-Mortar. Did you know that Google Analytics, AdWords and Search Console (Webmaster Tools) integrate and can work in concert to help your see the bigger picture of your site and your marketing efforts? Andrew Garberson has written an excellent article discussing the importance of tying together all of your key data points within Google Analytics. Maintaining an AdWords account can be a trying experience. Tap into LunaMetrics’ expertise and best practices to learn how you can tame the Monster that can be your AdWords account. Stephen Kapusta‘s informative article even offers a calendar template and other handy tips. Google Tag Manager (GTM) is a powerful tool to wield and unlocking its potential can bring both new insights and easier management. Read these blog posts and open your mind to the possibilities. The best place to start with delving into Google Tag Manager is with Kaelin Harmon‘s excellent blog post. It covers the many benefits (and potential pitfalls) of Google Tag Manager and how it supercharges your GA implementation. If you know your way around a website and have a little more technical background, this is another great read. Dan Wilkerson, one of our resident GTM gurus, writes a detailed article describing the recommended steps to move from on-page code to the wonderful world of GTM. So you’ve implemented GTM and something’s not quite right. Use our latest roundup of tools to help you single out and resolve the issue. The Data Layer object is an important part of passing information through the site into Google Tag Manager. Dan Wilkerson‘s four-part magnum opus covers all the details in an approachable manner. On the other side of this series, you will surely be a data layer master! You have an existing website. You like it just the way it is. Your tracking, however leaves something to be desired. Worse yet, you love your 10% bounce rate, but how do you know it’s real? SPOILER ALERT: It’s not. There’s nothing better to clean up the data cobwebs than an old-fashioned audit. Use these blogs to help you roll up your sleeves and dive in! In an audit, this is a great place to start. The distance between the top and the bottom of the page might as well be miles given the right circumstance. Where is your code? Is it in the right place? Read this and find out. Another great stop in your audit journey is here! There may be 20+ ways your pageviews are wrong, but it only takes one of them for the whole to be inaccurate. Read this and clean them up! You know something isn’t quite right, in your data but you just can’t put your finger on it. Let Dorcas Alexander be your guide into delving deep within the world of troubleshooting leveraging the data layer. She very clearly walks you through the process and you’ll have your issue ironed out in no time! Sometime little things can make HUGE differences in data integrity. What if you could make your data better in just two minutes? Read Jon Meck’s brilliant article and find out how. Before you get yourself into the weeds with cross domain tracking, ask yourself if you truly need it. If you want to report on completely different hostname URLs into one Google Analytics Web Property, then read on. Dan Wilkerson breaks it down beautifully. Congratulations. You’ve made it to the bottom of this page. Hopefully you’ve had an amazing and informative journey. If you didn’t do so already, go back and read through the section(s) that best speak to you. Let these collections be a springboard to new knowledge and further understanding. Beast Mode… UNLOCKED!